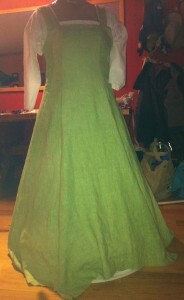 I now have a very nice apple green kirtle that will serve as an underdress for my Flemish Gown. 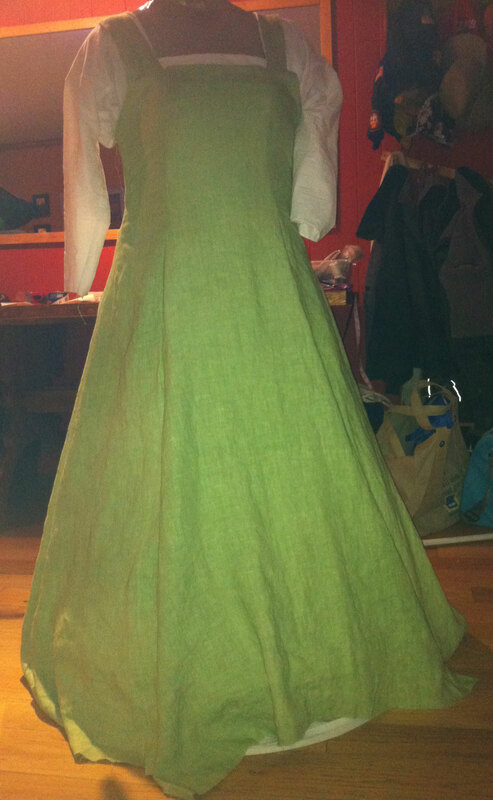 The kirtle went together well from the pattern I’d made. I decided not to line the underdress for now, as I’ll be wearing the overdress which will have two layers of linen plus the linen smock, and that seems like a lot. If I don’t feel too hot in four layers of linen this weekend, I’ll go ahead and line the underdress with more linen later. So I just need to finish the neckline, hem the bottom, and complete the hand-bound eyelet holes on the side (I decided to make this a side-lacing kirtle). Once that is done (today, I hope), it’s time to move on to the overdress. 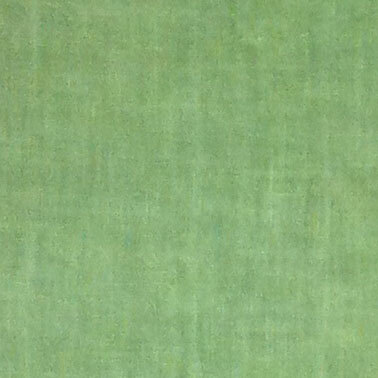 It is supposed to be a darker green (Juniper from Fabrics-store.com) and a golden yellow. I’m just not so sure about the yellow with the green, however. 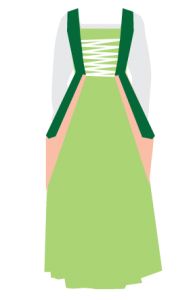 So I think I’m going to switch colors from my palette and do the pink color with the green overdress and move the yellow over to the blue dress, so it’ll look more like the picture on the right. I think the pinkish color goes better with the greens. And, yes indeed, pink is period. I used it on my first-ever SCA dress in the ’90s, then thought, “wait, would they have worn this color back then?” and decided no and didn’t wear it again. But since returning to the SCA, I’ve discovered that pink is very much period. I don’t know where I (and others) came up with the idea that pink wasn’t period. There are many, many plants that will make pink, or light red, dyes, so it makes no sense that it wouldn’t have been used. Perhaps it’s just that pink, especially a color like hot pink, seems very modern. Also, I think the word “pink” isn’t an ancient word, it’s usage as a noun dating back only to the 17th century — I’ll bet that’s why it seems modern. Thankfully, the color itself is period, because I happen to love pink. It’s my second favorite color after green! So pink linen … yeah, don’t have any of that either. Guess I need to dye more linen. Rit makes two pinks … a petal pink and a rose pink. Rose is too much; so I think it’ll have to be petal pink. I may not dye it quite so much, though — I don’t want a bright pink! So I guess a trip to Joann’s is in store for me later today after work. I’m lovin’ this dress so far! Today was my first foray into dying fabric, believe it or not. I’ve thought about it many times over the years, but never managed to find the motivation. But this time around, I needed a light green linen — you can’t get that color at Joann’s, and I couldn’t find the right shade of green at Fabrics-Store.com (Midori comes close,but it looks too “lime” yellow green, and Willow seemed a bit lighter than I wanted). I would have been willing to settle for the Willow linen, but … I need this dress done in 5 days and there’s just not time to get an order of linen shipped. So I got a bottle of RIT Apple Green dye from Joann’s and gave it a whirl. Directions say to mix half a bottle with three gallons of hot water and a cup of salt, and stir constantly — finding something to stir with that wouldn’t turn the same color as my dye or hurt my linen was a bit challenging, but I settled on a stainless steel spatula. I put the dye, salt, and water into a big tub. I used the hottest water I could get from the tap plus a pot of boiling water fresh off the stove. I also filled my bathtub a few inches full of hot water, hoping that would keep the water in the tub hot. Before I put in my linen, I washed it but did not dry it — I read that if the linen is wet when it goes into the dyebath, it is less likely to dye unevenly. Once the dyebath was ready, I put in the linen, trying not to bunch it up too much (again, something I’ve heard can cause splotchy dyeing). I stirred, or attempted to stir, the linen in the tub for 30 minutes. 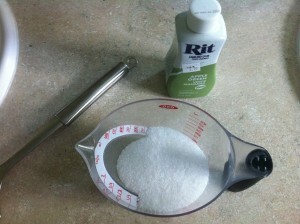 3.5 yards of wet linen is not an easy thing to stir! So I half-stirred, half agitated the water … then every 5 minutes or so I took the linen out, let it fall flat, and put it back in the water. I was hoping that would unbunch/uncrease any folds of fabric so that, over the 30 minutes, the fabric would touch the dyebath relatively easily. 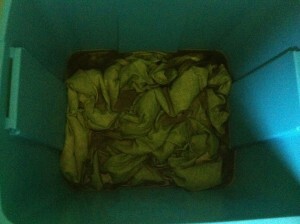 After 30 minutes, I took out the linen and rinsed it. I was supposed to rinse it until the water ran clear, but this proved hard to do, so I just did what I could. The next step called for me to wash it with detergent, so I just took it to the washer, added a little detergent, and washed it. Then I dried it in the dryer. I wanted maximum shrinkage before I began cutting and sewing, as I would like to be able to just machine wash and dry this dress in the future. It looks delicious … and just the color I wanted. The linen took the dye evenly and it all seemed to work great. Interestingly, I noticed that when I ironed the dyed linen, the color lightened just a bit, but darkened again when it cooled, though perhaps not quite as dark. I wonder if that will happen everytime, or just the first time. Well, now the fabric is laid out and ready for cutting into my kirtle pieces!